You can share what’s on your screen at the moment with your Google +Hangout attendees. This is a beneficial option for social marketers because it allows you to other media options to gain exposure for your brand. It is also handy for sharing a slide deck for a presentation or to show a website or online video, for example. From inside a Hangout, click the Screenshare button on the menu bar at the top. 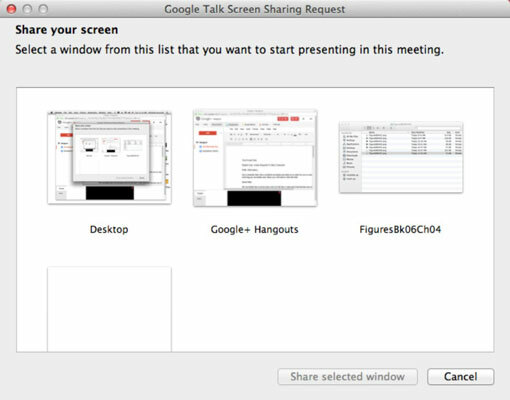 You can share your desktop, your Hangout screen, a Google Doc you’ve uploaded, or an Internet window you have open. You’ll have the opportunity to choose what you wish to share. Click the Share Selected Window button, and it opens in a new window. After you finish sharing, simply close the window of your shared screen, and you and your guests will automatically return to your Hangout screen. Your Hangout attendees will see everything on your screen in real time, so make sure you have any sensitive information you don’t want seen or Internet windows closed!